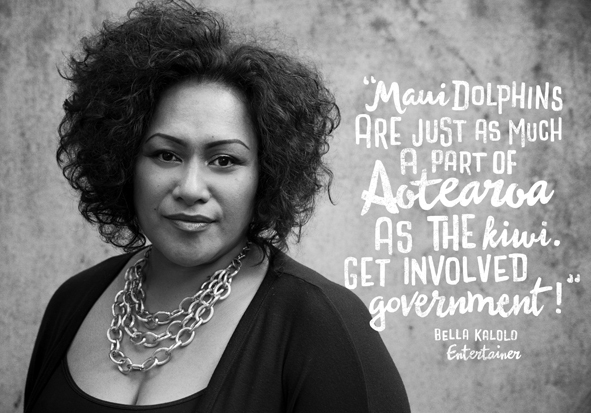 Bella Kalolo is a soulful lady with a big voice and now she is stepping up for those who do not have one, by heading the the WWF New Zealand campaign to save the last 55 Maui’s Dolphin from extinction. In this interview Bella talks about why preserving our precious native dolphins is so important, how we can also preserve the wellington music industry, as well as what has become important in her life in music. Thanks to Lou Hatton for this great shot of Bella and all the shots for the WWF Last 55 Maui campaign. Also nice illustration by Lisa Nicole Moes. And here is a link to Bella singing “I’m every Woman” with Chaka Khan. This entry was posted in Arts & Culture, Environment and tagged Bars, Conservation, Music, Politics, Volunteers by lauriestarfish. Bookmark the permalink.